The Algerian War of Independence ends. Algerian War, also called Algerian War of Independence, war for Algerian independence from France. The movement for independence began during World War I and gained momentum after French promises of greater self-rule in Algeria went unfulfilled after World War II . 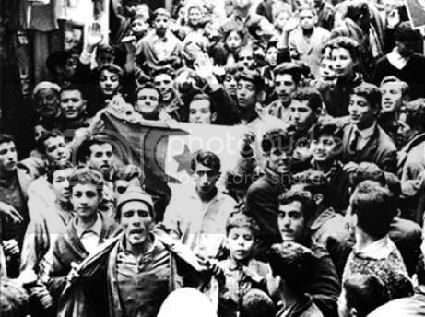 In 1954 the National Liberation Front began a guerrilla war against France and sought diplomatic recognition at the UN to establish a sovereign Algerian state. Although Algerian fighters operated in the countryside—particularly along the country’s borders—the most serious fighting took place in and around Algiers, where FLN fighters launched a series of violent urban attacks that came to be known as the Battle of Algiers. French forces managed to regain control but only through brutal measures, and the ferocity of the fighting sapped the political will of the French to continue the conflict. In 1959 Charles de Gaulle declared that the Algerians had the right to determine their own future. Despite terrorist acts by French Algerians opposed to independence and an attempted coup in France by elements of the French army, an agreement was signed in 1962, and Algeria became independent. Upon independence, in 1962, 900,000 European-Algerians fled to France, in fear of the FLN’s revenge, within a few months. The French government was totally unprepared for the vast number of refugees, which caused turmoil in France. The majority of Algerian Muslims who had worked for the French were disarmed and left behind as the treaty between French and Algerian authorities declared that no actions could be taken against them. However, the Harkis in particular, having served as auxiliaries with the French army, were regarded as traitors by the FLN and between 50,000 and 150,000 Harkis and family members were murdered by the FLN or by lynch-mobs, often after being abducted and tortured. About 91,000 managed to flee to France, some with help from their French officers acting against orders, and as of 2016 they and their descendants form a significant part of the Algerian-French population. "The mind that is anxious about future events is miserable." This entry was posted in Uncategorized and tagged 19 March, 1962, Algerian War by admin. Bookmark the permalink.